Separation from someone you love is never easy. Especially when it's your child. My baby goes off to school tomorrow, and my emotions are running a bit high right now. I've never really done this with a young child. We homeschooled her older brother until he was seven, and then he just jumped right in. I definitely cried. This feels different. She seems so little and very grown up all at once. I had to make her something sweet for this moment. 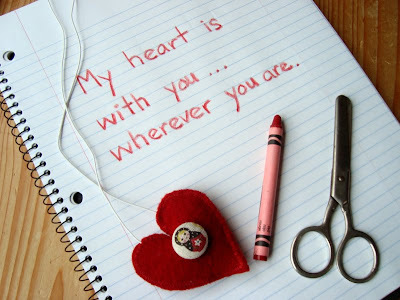 Something to take with her, to feel my love at her side. I did this for me, just as much as I did it for her. This little lavender-filled sachet can be worn as a necklace resting close to her own heart... or tucked into her "big girl" back pack. I thought I'd include the instructions... you may know someone that needs a little bit of your love close to them, too. 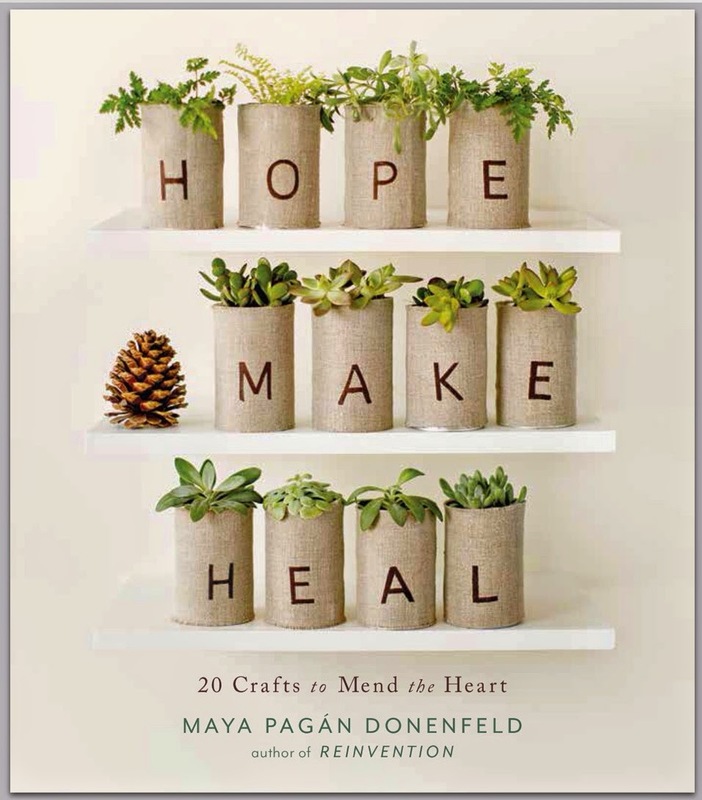 These would also make wonderful Valentine's gifts, party favors, present toppers, stocking stuffers, etc. If you use a covered button, make a tiny slit in the center of one heart. I made mine too large and had to sew it up a wee bit to keep the lavender from peeking out. Thread cord through button and pull both ends throught the front heart's hole. Pull cord tight and place both ends coming out on either side of the heart curves sandwiched between the front and back pieces. Pin in place. 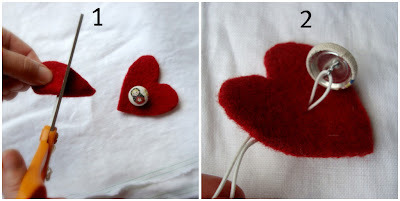 If you didn't use a button, simply pin your cord in place sandwiched between the two hearts. Sew around the heart leaving a little opening on the pointy bottom (see picture). 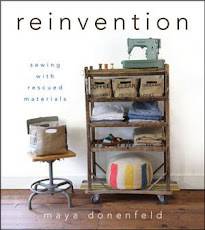 Use a blanket stitch for hand-sewing and a zigzag for the machine, if you need one in a hurry! Add beads if you'd like. Felted ball beads would be sweet. I kept mine simple. Knot the two ends. Note: thank you so much for giving your hearts to my last post. There were so many insightful comments, that I've put a link to it in my sidebar. Now, you can click on it if you're ever needing a little inspiration. I will leave the comments open, and you can continue adding to the list of how you love each day. I did something similar for my biggest girl when she was having trouble separating. It certainly made me feel better. Hope it all goes smoothly tomorrow. Yes, I have suggested these to parents too - even with a photo stitched on the front, even as a little tiny drawstring bag that contains a special crystal. The lavender is a nice touch: a sweet smell to go with the sweet thought of mummy. so sweet, your mother heart shows through! hope it goes well! I know exactly the feeling! Last week was my daughter 1 day, and the only one trying to hide tears from her eyes was me! It is a symbol of love for mother daughter relationship she is leaving you for school for some hours you are feeling emotional.The Time she will get married and will leave you forever what will you do.Just keep your emotions and feelings for that special moment.Lavender Heart is a simply memorable gift for her she will remember it forever that how much you do love her.Love has no words. This is just so so lovely and precious! It reminds me of this sweet book, "Oh My Baby, Little One." Have you read it? My children love looking for the little red heart representing mama's love that is always with the little boy as he goes through his school day. And then there's the book The Kissing Hand. So very sweet. My daughter holds her hand out for me to kiss when I drop her off at daycare so she can have it with her all day long. This is too sweet for words. Anything to help you get through such a huge adjustment. All the very best to you both on this new adventure. Lots of love. That is SOOO cute! Good luck to both of you. It's going to be great! Oh, this almost made me cry! And my 4 "babies" all started school LONG ago! But this is SOOOO sweet. My mum is coming to visit from Australia in a few weeks, so maybe I'll get my daughter to make her one of these to take home with her. Hope this week goes well for you.. This is so sweet! The button makes it for me. My soon to be five year old grand children went off to Kindergarden recently...they live in a different town so I didn't see them off...their mom said they did fine...they like it, are old troopers as they'd been in pre-school since age two...but just the same my heart is with them every day. Your little button heart is sweet and I bet helps her transistion just fine. I hope you are wearing one around your neck as well. You are such a sweet mama. Such a sweet little treasure of love. one day in K... she fell and got hurt.. the teacher told her to wash her hand and then she would put on a bandaid. She got sooo upset...it will be ok she told the teacher...my momma already kissed it! She is soo cute. The teacher called me and asked if I wanted to pick her up or at least tell her to wash it. 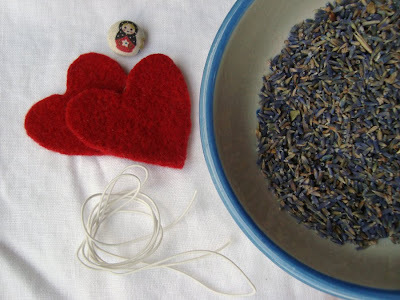 Hi Maya, I read this post this morning as I was starting my day, and LOVED the idea...and since today was my little girl's first ever day of playgroup, I grabbed some lavender stuffed felt hearts that I had made last winter as Valentines gifts and stuffed one in her pocket. Such a soft sweet thing to send her off with! Thanks so much for the inspiration. I blogged about it today as well! 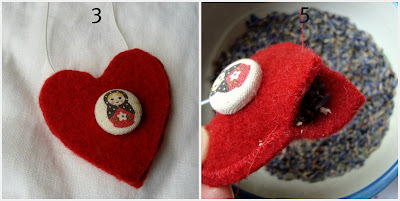 I'm making a little heart for Poppy to take to school next year, I never thought about making it into a necklace though. Maya you are so sweet. I'm glad I am getting to know you. this is absolutely precious! what a great little gift! I just want to say Thank-You for this idea! You inspired me to create one something like it. I hope you will check out my blog and see the finished project. I also mentioned your blog to let people know where I got the idea. Hope you have a wonderful week! I'm a first time visitor you your blog and so glad a stopped by, what a wonderful little place you have here in cyberspce. I am adding you to my links. 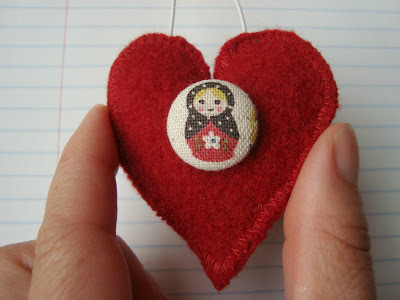 Oh and the heart ... what a sweet project, I love it. Happy day to you. Your project came in handy this morning, when my son declared that he didn't want to go to school today, on this his second day of school. Well, we whipped up a little mushroom-shaped lavender sachet necklace for him to wear to school to remember me by. He was so proud of our collaboration and made the first classmate he encountered take a sniff. Thanks for the inspiration! That is beautiful! I love that the pp made one for her son as well. Can you imagine dropping her off and seeing another child with the same heart around their neck?!? I just love this, I'll be linking. Congratulations on her first day. I can't even imagine how difficult it is, but what a huge accomplishment for you both! Wonderful, I just shared it at my blog that it could also be an ornament!